In these days, wineries all over the northern hemisphere are occupied with handling the grapes they have just harvested and to produce the wines that will grace our tables in the years to come. This period is fraught with risks and can greatly influence the scores wine professionals will give to the wines when they have a chance to taste them. Just as we have seen with Rosés and Sparkling wines, and just as we will see with the making of Sweet wines in the next issue, the production of whites and reds is now facing a multitude of key decisions that ultimately affect style and quality. The key driver of any decisions is first and foremost the intended style of the wine. Unlike what marketing brochures tell us all over the world, a winemaker already has a pretty good idea of the style he wants to make from one plot to another. Therefore, his harvest decisions are taken accordingly and so are those taken in the cellar. At high quality wineries, the first step usually undertaken as the grapes arrives to the cellar from the vineyard is their sorting. They will be gently dropped on a vibrating table so that rotten berries, fragments of leaves, insects or other unwanted materials can be removed. This will insure a healthier juice at fermentation and optimize purity of aromas as well as reduce the amount of SO2 required for its antiseptic properties. White grapes are normally pressed immediately to avoid contact between the juice and the skin. It minimizes color uptake, preserve acidity and helps to optimize the estery character of wines that are destined to be crisply refreshing and intensely aromatic with vibrant aromas of grapefruits, and exotic fruits. If the skins of white grapes are left to macerate for a few hours before pressing, the wine will have an added and softer textural element and it will optimize the varietal character of the wine. Red grapes are naturally left in the juice to macerate for various period of time before, during, and/or after fermentation. Color is usually extracted during the first few days of fermentation whilst tannins are extracted in the presence of alcohol towards the end of fermentation. Once it is decided that the length of maceration should be terminated, the juice is separated from the skin and the remaining skins are pressed for later use or for distillation. In fact, many use press wines as they are the most tannic and deepest in terms of color and fruit concentration. Judiciously blended into the final wine, such wine can help with ageing ability. Lighter and fruitier wine normally see minimal maceration and only a gentle extraction of color and tannins to preserve their vibrant fruity aromas and lighter tannic structure for refreshment quality rather than for their ageing ability. Fermentation can be kick started with selected yeasts or left to its own device to begin naturally with natural yeasts. Many winemakers prefer selected yeast as it helps them to control the process and avoid off flavors and various possible taints. This process is greatly influenced by the choice of vessel. Inert materials like stainless steel preserve fruit freshness, vibrancy and purity whilst containers made of oak tone down the intensity of fruity aromas. Smaller wood containers have more influence than larger ones and wood containers optimize evaporation during the process thus helping to release some alcohol as well as provide additional textural elements to the wine. The challenge with using oak for maceration and fermentation of red wines is that the process is extremely messy and requires a high amount of work to maintain the vessels and avoid bacteria to infect the wine during subsequent processes and cause off-taints. Once fermentation is complete, the wine can be transferred into inert vessels for maturation and storage or it can go into oak barrels and casks. Inert containers favors freshness of aromas and vibrancy of texture whilst oak containers concentrate the wine and modify its aromatic profile depending on the size and whether the wood if old or new. 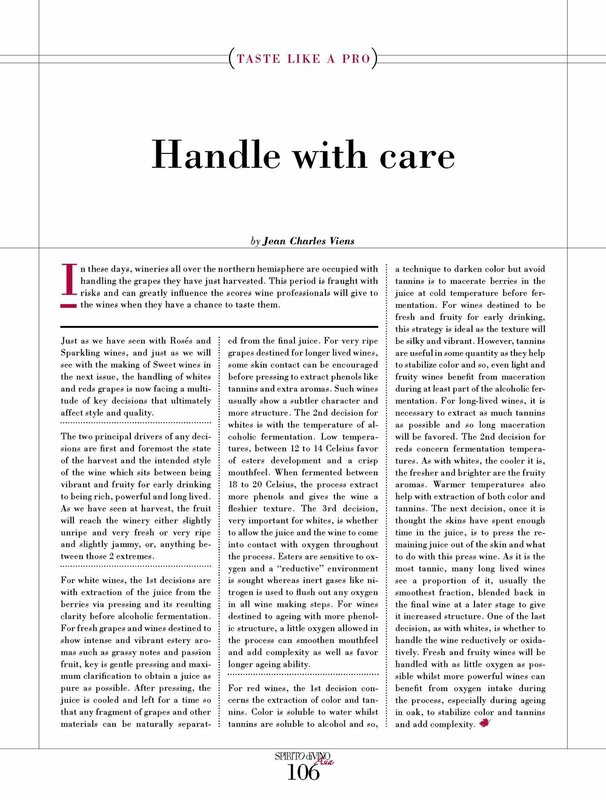 In issues number 18, we reviewed in details the effects of oak on winemaking.